The Sierra Leone government to re-engage Fifa by the end of this month Football Sierra Leone has learnt. The Country’s Anti-Corruption Commissioner boss, Francis Ben Kaifala, has confirmed that government is hoping to engage Fifa by the end of this month over the pending suspension. 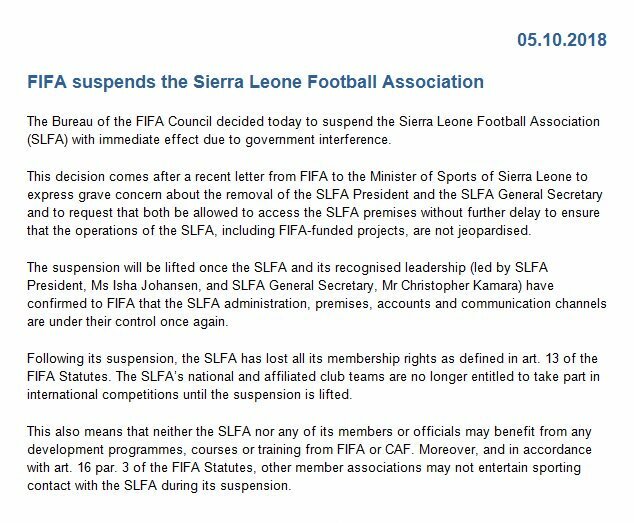 Today April, 5, mark six months since the Fifa Bureau Council suspended the Sierra Leone Football Association (SLFA) on allegations of government interference. Fifa announced the International suspension on the 5th October 2018 and two weeks after reiterated that the country hold-up will continue until the alleged corruption trial against SLFA head Isha Johansen and sec-gen Chris Kamara concluded. “The matter has been reserved for lawyers to provide final submissions within the next two weeks,” the ACC boss Francis Ben Kaifala has confirmed. “Then, it will be withdrawn for judgment. We’re hoping that by the end of this month, the matter will be finally concluded and then we can re-engage with FIFA,” he explained. It could be recalled that the ACC maintained that there are no exceptions with regards to the ‘rule of law’ in Sierra Leone. The embattled SLFA boss Johansen and Sec-Gen Chris Kamara were both removed from office. Both have denied any wrongdoing. In the communiqué released, Fifa maintained that the discussions were cordial in paving the way forward after the country’s suspension. “FIFA will wait for the completion of the trial before further measures can be considered, including the lifting of the suspension by the Bureau of the FIFA Council, if deemed appropriate,” Fifa said after talks with top government officials. The investigation into the alleged match-fixing also took centre stage following confirmation that a delegation will visit Sierra Leone in early November to look into the matter. A Fifa delegation visited Sierra Leone in November 2018 to do their findings since then nothing has been said by Fifa. CAF disqualified Sierra Leone from the 2019 African Nations Cup qualifiers (Group F) due to the pending suspension. Follow us on Twitter @football_sierra – Facebook/Instagram Football Sierra Leone, – the writer @bittar32 – contact bittar@footballsierraleone.net. 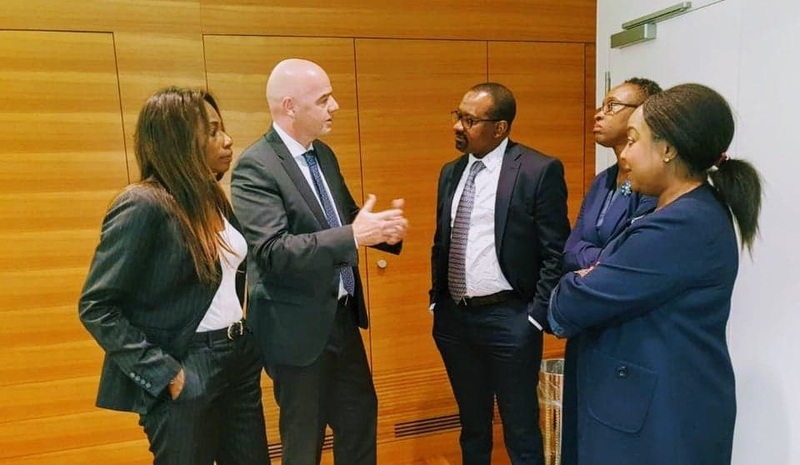 Photo: SLFA President, Isha Johansen, FIFA President, Gianni Infantino, Sierra Leone Vice-President, Mohamed Juldeh Jalloh, Sierra Leone Attorney General and Minister of Justice, Priscilla Schwartz and FIFA Secretary General, Fatma Samoura, at the Home of FIFA in Zurich last year.